Sometimes you just need a little daycation and this month we decided on an Asian Daycation. We zipped on up the highway to Zion Market, a Korean marketplace, in the Kearny Mesa area of San Diego. The large building houses the supermarket, but also a variety of restaurants and services including a travel company, hair saloon, and clothing stores. We first did a spin around the building looking at each restaurant’s menu and then browsed the market’s aisles. From freshly prepared to frozen foods are all there to entice you to try a Korean inspired menu for your next meal. They “strive to give customers a deeper understanding to the culture of Korea by the distribution of various foods and household goods.” Here’s their website: www.zionmarket.com. 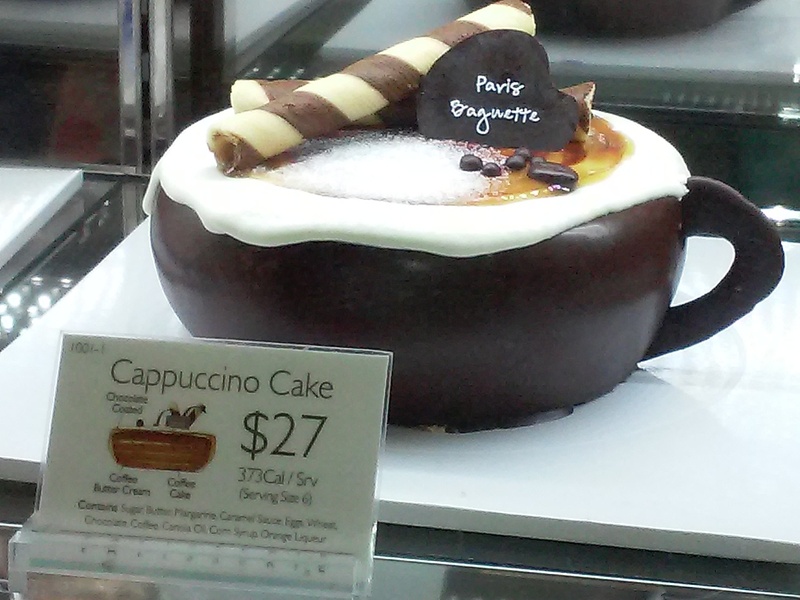 Paris Baguette caught our eye and we strolled the rows of their sweet and savory offerings. We, of course, were completely impressed with the cappuccino-coffee-cup styled cake (pictured). Can’t wait to figure out when I can buy that cake to share with friends! Paris Baguette was established in 1986 and opened its 100th store in 1992 the same year they opened their Korean-French Institute of Baking in Seoul. This premier baking franchise now has more than 3700 worldwide locations with two of them in San Diego. To learn more about the history of Paris Baguette and see their menu, visit www.parisbaguetteusa.com. We noticed a small sign stating there was a Korean Library and it piqued our interest. The library is tucked away upstairs, but the librarian was charming and so kind. What an outstanding selection of books for all ages waiting for those who want to find a book in Korean. As we made our way towards the highway to return home we swung by Daiso Japan (8199 Clairemont Mesa Blvd. ), the equivalent of a Japanese $1.50 store. The store is cheery, bright, well-lit, clean, and full of interesting items all with Japanese packaging and labels. A full morning of all things Asian left us feeling like we had been on a mini vacation with each of us knowing we’ll have to figure out another daycation adventure soon. This entry was posted in croissant, Korean market, pastry shop and tagged Adagio Coffee, Kearny Mesa. Bookmark the permalink.